The Leapers scp-rdm39cdq UTG 3.9" red/green circle dot reflex sight is precision machined from aircraft-grade aluminum with matte black hard coated anodized. Tactical reflex sight is built on true strength platform heavy duty recoil rated shockproof, fogproof, and rainproof. Sight has red/green dual-color illumination to accommodate different weather/light conditions. Reinforced windage & elevation adjustment for added zero retention. 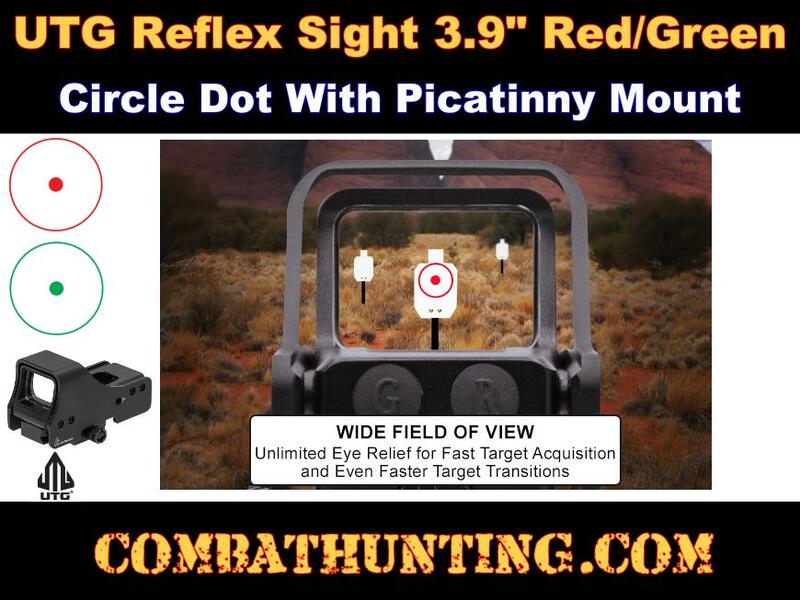 Features a 4 MOA single dot enclosed in a 58 MOA circle extra large field of view with unlimited eye relief for fast target acquisition and even faster target transitions. Complete with integral picatinny mounting deck for quick installation out-of-the-box and guard shield for added durability and structural integrity out in the field. UTG Limited Lifetime Warranty. Click Value @100 yards: 1"